You may bring your own standard wheelbarrow or use one of our own if available! Open for normal EWE-PULLET business as usual also. New This Year: Pimp Your Wheelbarrow a Facebook contest. Design and customize your wheelbarrow for fun and a chance to win prizes ! We will be taking photos on October 13, 2018, the same day as our Fall Harvest Day event. EWE PULLET SCAVENGER HUNT!!! There will be 20 specially marked parts on cars in the facility. They will be marked with specific pink bright color paint. If you find any of the parts, pull them and bring them to the office, you will receive the same value as what it would cost to buy the part in credit on an EGG MONEY in-store credit card! There is also the OWNER / MANAGER showdown with two special GOLD color painted parts that are worth $50.00 Cash each! Have you been getting your EWE PULLET Price Book stamped? For everyone that has turned a fully stamped Price Book sheet, there will be 5 Drawings throughout the day. Turn in yours now if not you can start a new one for next year. Get stamps every time you buy from E.P.! Someone will win a 32” Sanyo Smart TV; 2.- $100.00; 3.- $75.00; 4.-$50.00 in Store Credit and 5.- Ewe-Pullet T-Shirt and Hat ! $1.00 Coupon for on site concessions for everyone signed in! Concessions by Lunch Wagon-Hernandez and MO’s Concessions. Inflatable for the kids– for this special day bring your kids. Childcare is not provided and children must be supervised! Children’s are not allowed in the vehicle lot. 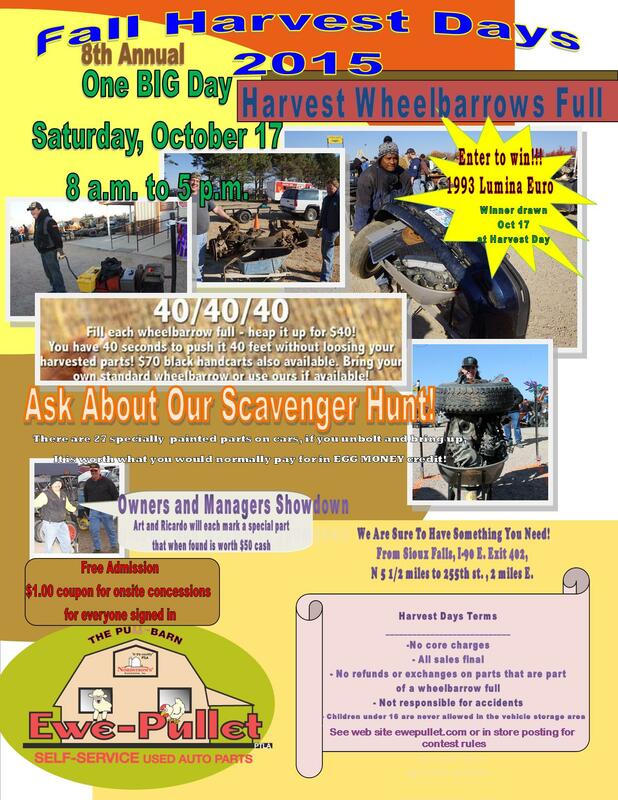 40-40-40 Rules and Notes On the day of the event, pull as many parts as you can fit in a Ewe Pullet Wheelbarrow or bring your own STANDARD 6 Cubic Foot single wheel Wheelbarrow (No modifications). Carefully position the items in the wheelbarrow and bring it to the staging area in front of the “Pull Barn”. When you get the signal, one person will need to push the items 40 feet within the 40 second time limit. Also $70.00 handcarts available and $100.00 Express line. Don’t forget “Honk the horn-ring the bell! RULES: Absolutely No Strapping of any sort. No hoods, trunk lids, pickup boxes, bed liners or tailgates can be used as a stacking base. Blow the horn before your 40 foot trip then ring the bell thru the course and you have 40 seconds to do it. Lift Hoist cannot be moved to pull a motor or transmission until ready to use. 4+ available. We have parking available in field to the North thank you to the great neighbors we have. Please respect their farm ground so we can use it again in the future. We will allow tool drop off and parts loading only in main parking lot. Country club members will be allowed to park in the main parking lot as a benefit of membership. Remember you can buy your Ewe-Pullet Country Club membership today and any day! Come and enjoy the day, even if just to watch!!! Harvest Rewards Card at no charges Sign Up Today and earn 3% in store credit every time you buy parts from us. This is a great loyalty program everyone can sign up for. Loyalty rewards can not be used on Harvest day wheel barrow purchase. We want to remind you about our EWEPULLET Facebook page, where you can go and like us and also you will be able to post picture of the Harvest Day, any illegal or obscene posted picture we will deleted from the page immediately. 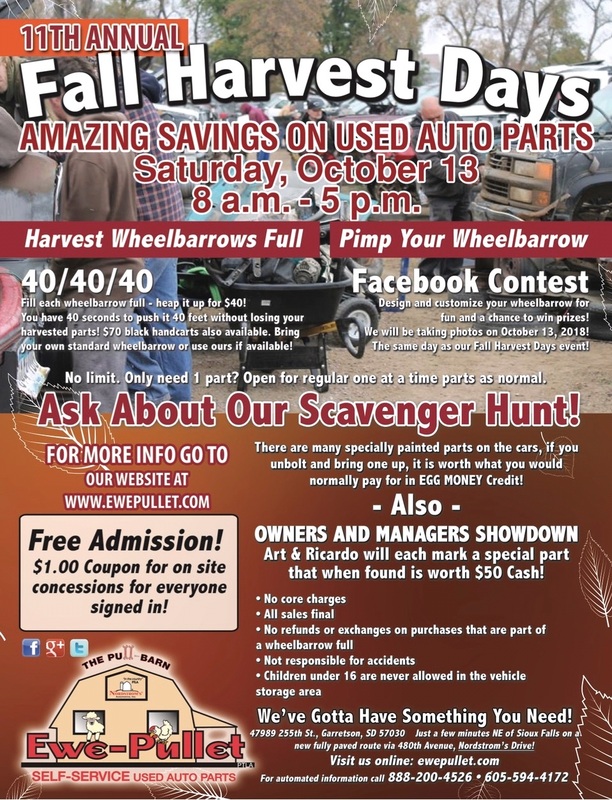 We invite you to participate to Earn Money as Parts Puller at Ewe-Pullet, visit our web site ewepullet.com and go to the Parts Puller Program or stop at Ewe-Pullet office between Monday to Friday for more information. At 12:00pm we will start the Raffle and draw the winner’s names of the prizes and also the one who’s filled the price book back page with Ewe-Pullet stamps. The hours of the sale are 8:00am to 5:00pm any part after the hours will cost regular prices. ALL SALES FOR WHEELBARROW AND CART ITEMS ARE FINAL! NO RETURNS – NO REFUND- NO WARRANTY- Regular purchases through the office are treated as normal with a 33-day wide open return policy. HAVE FUN AND THANK YOU EWE PULLET CUSTOMERS! Serving the Automotive Professional and Do-It-Yourselfer in the Garretson, South Dakota Area Since 1969 Amazing Savings on Used and New Alternative Parts - Just NE of Sioux Falls, SD on a fully paved route via 480th Avenue, Nordstroms Drive.